The common name for Xanthostemon chrysanthus is the Golden Penda. 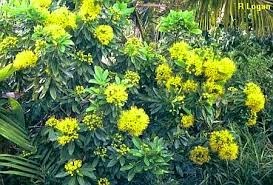 It is a beautiful rainforest tree native to North Queensland and grown for its attractive yellow flowers. 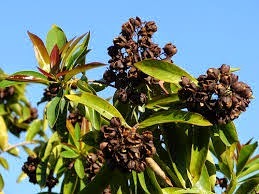 In its natural habitat the tree can grow to 30 metres but in cultivation it will only grow to 10 metres. The Golden Penda is in the Myrtacea family, related to Lillypillies and Eucalypts and the flowers are very similar, having lots of stamens grouping together in a big bunch. The flowers give way to seed capsules a centimetre wide. Even though the tree can grow tall it doesn't grow very wide and tends to branch close to the ground in the garden. The crown is dense and dark consisting of narrow leaves 20cm long with a smooth grey trunk. The Golden Penda is commonly cultivated and is widely planted as a street tree in Coffs Harbour giving a spectacular display in the landscape. 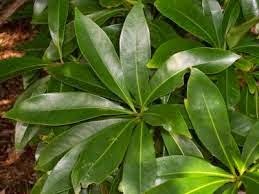 In the garden it requires rich well drained soil and full sun to flower well. It is hardy and will grow fast in good conditions. 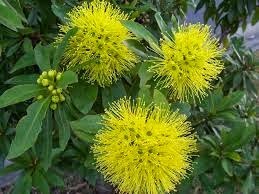 The Golden Penda will flower at an early age around Autumn but can spot flower at any time and birds love the flowers. It makes a great privacy screen and a perfect addition to a native or rainforest garden.